Mudskippers make fascinating pets with their entertaining behavior and funny antics . Mudskippers are able to live both in water and on land, walking around on their pectorial fins . Mudskippers are known as schlammspringer in German, トビハゼ in Japanese and 跳跳魚in Chinese .Mudskippers are members of the subfamily Oxudercinae , within the family Gobiidae (Gobies). Mudskippers are tropical fish that are found in equatorial Africa, Madagascar, Arabia, southeastern Asia, Japan and Australia, frequently in Mangrove swamps .The Atlantic mudskipper can grow to 7.9 - 9.8 inches and has about a 5 year lifespan . The mudskipper is one of the few species of fish in the world capable of living out of the water. This amazing ability means it can feed on the tiny algae, crustaceans and worms which live among the mangroves. And it comes out of the water not just to get food. 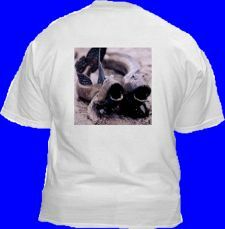 Courtship also takes place on land. The male shows off his dorsal fin to the females. As they don’t have legs, the mudskippers use their pectoral fins to propel themselves along. To breathe, they use a system similar to the crabs: they retain water in their gills. When they ingest food, they have to expel this water, so the mudskippers constantly need to replenish their reserves. This also keeps their skin wet, this is very important, because that is another way in which they absorb oxygen. How can mudskippers live out of water ? Mudskippers are able to extract oxygen from different parts of their body . recent research has found mudskippers don't use their gills for oxygen exchange, but use their skin for a large part of their oxygen processing . They use their gill filaments to exchange ammonia .Mudskippers must always keep their mouths and skin moist, since the oxygen needs to diffuse with water before they can absorb it . 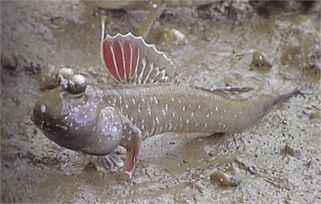 They are completely amphibious fish, uniquely adapted to inter tidal habitats, unlike most fish in such habitats, which survive the retreat of the tide by hiding under wet seaweed or in tidal pools.Mudskippers are quite active when out of water, feeding and interacting with one another, for example to defend their territories. Which fishes are considered brackish water fishes? What kind of tank should brackish water fishes be kept in? What special conditions do these fishes require? These questions are answered in Neale Monks 384 page "Brackish-Water Fishes: An Aquarist's Guide To Identification, Care & Husbandry"
Mudskippers need to live in habitats that are hot and humid in order to breathe , where air and water temperature range from 75 to 86 F and humidity from 60 to 80 percent .Mudskippers are only active when temperatures are above 55 F . Mudskippers live in brackish to normal seawater depending on the species .It grows to a length of about 6 in (15 cm) and is a carnivorous opportunist feeder. Mudskippers dig deep burrows to escape predators and raise their young . they maintain a air pocket in their burrows to breathe . in order to invite female his home. During the mating season, the male's colors become more intense and the male becomes much more active . Males do what appear to be pushups, leap and flip in the air and even stand on their tales - all to attract female mudskippers. the male becomes more aggressive torward other males with biting and raising its dorsal fins . If the female is attracted to the male, she does her own mating ritual with distinctive movements . She then goes into the male's burrow where she lays her eggs in a special part of the burrow the male builds her . The males then fertilizes the eggs and takes over responsibility for the eggs. to oxygenate the eggs, the male swallows air on the surface and releases it in the mudskipper baby burrow . In water, mudskippers swim in side to side movements like other gobies . Mudskippers have to main ways to get around on land, on is to walk about on their pectoral fins , the other is to skip or jump, hence their name .